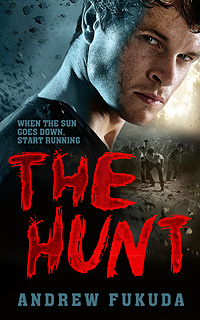 The Hunt is written from the perspective of a young man in a world of Vampires. In this world, vampires are the norm and humans (or 'hepers', as they're referred to in the book) are dirty, uneducated, extremely rare animals. Gene, the main character, just so happens to be a human and has to hide his identity from everybody around him, to save his life. The way the book was written really involved me in this world - it assumes you are part of this world and that you don't fully understand daily heper activities, such as laughing or sweating, so it explains them to the reader. In my opinion, the book was heavily influenced by The Hunger Games, but with a Vampire twist. Every so often, there is a 'heper hunt' where Vampires from different schools are selected by lottery to be trained and then let into the wild to hunt and devour hepers who have been captured by the government. Although in an alternate fantasy world, the book does definitely have a brief social commentary - if you read between the lines - on the government and the media, particularly towards the end. The Vampires in the book are described to be ravenous, hungry animals with a gory thirst for heper blood and in parts, it can be quite revolting. The description of the characters is, in some parts, so detailed that my stomach felt queezy as I was reading about what happened when the Vampires went into the sunlight. Those parts definitely aren't for the weak-stomached, although saying that, it doesn't take up much of the book. Overall, the book delivered as an intriguing fantasy that offered escapism from daily life. Although this book is technically teen-fiction, I would recommend anybody to read this as it's a fun way to fill a few hours of your life - and it is incredibly well written.